A human body is not only composed of human cells – we are host to a multitude of microorganisms, without which we would not be able to survive. As such, humans, and all other organisms are truly metaorganisms composed of a host and a complex microbiome. Professor Thomas Bosch at the Zoological Institute at the Christian-Albrechts-University of Kiel, Germany, studies the complex interactions which take place within metaorganisms between host cells and microbes. For most of the history of medicine, the human body has been regarded as a solitary entity. While it has been known for centuries that we harbour many microorganisms in and on our bodies, for the majority of this time these microbes have been regarded as pathogens at worst and insignificant hitchhikers at best. However, over the past decade researchers have begun to realise that we, along with all plants and animals, share a long co-evolutionary history with our microbes. Far from parasites, they play a vital role in our health and wellbeing – they are written into our genome and we could not experience a normal life without them. There are no solitary organisms, instead, every plant and animal on Earth is a metaorganism. A metaorganism is a host and its complete microbial community is commonly referred to as the microbiome. Over half the cells in a healthy human body are not human at all but belong to the multitude of species that compose our microbiome. We now know that our bodies have evolved to utilise these microbes in critical aspects of our biology, from digestion to immune function, to mental health. We are just beginning to scratch the surface of understanding what it means to be a metaorganism and how microbial relationships shape biology as a whole. Professor Thomas Bosch at the Christian-Albrechts-University of Kiel, in Germany, is an evolutionary developmental biologist and pioneer of metaorganism research seeking to shine a light on these relationships. While scientists are beginning to appreciate the powerful contributions of the microbiome to human health and biology and are beginning to form an understanding of the species of microbes that are commonly associated with good health, it is difficult to study microbial relationships in detail in humans. The vast array of human diets, lifestyles, and living conditions, combined with our long lifespan and the inability to monitor a person 24 hours a day, all make it near impossible to perform experiments with human subjects that can accurately tease out the effects of a specific microbe, let alone a complex community of microbes. However, getting a handle on these interactions is critical for the progression of modern medicine. 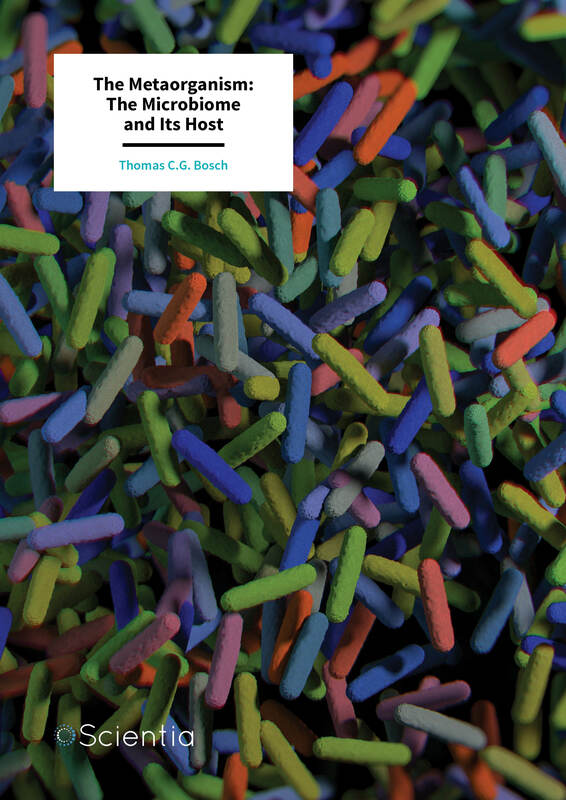 Professor Bosch notes that, ‘disturbing the microbial interactions within metaorganisms is one of the major causes of many “modern” and chronic diseases.’ In order to develop a high-resolution understanding of the evolutionary history of metaorganisms and the health implications of our microbial relationships, it helps to study them in smaller, more simple creatures. The phylum Cnidaria, whose members include jellyfish, sea anemones, and coral, also contains a tiny freshwater organism called Hydra. These little creatures, less than 15 millimetres in length, resemble tiny sea anemones and are easy to raise in large numbers in a laboratory. Hydra are a perfect model system for exploring fascinating questions about interactions between hosts and microbes. Their biology is simple enough to control for a multitude of environmental factors like diet and living conditions and complex enough to display highly evolved connections with their microbes. Further, they have an unlimited lifespan, showing an ability for self-renewal that is unparalleled in the animal kingdom. Interestingly, the gene that regulates this process is also deeply tied to the Hydra’s relationship with its microbiome. Professor Bosch and his team utilise these small aquatic animals in their research to illuminate how evolution has shaped host-microbe relationships to form metaorganisms. Hydra initially drew scientists’ attention as a target for research efforts due to a unique characteristic – immortality. These tiny organisms do not age and can live for an unlimited amount of time, thanks to special cells called stem cells with the ability to proliferate indefinitely. Naturally, researchers have been curious to determine the mechanisms underlying this regenerative ability and understand how they relate to mechanisms of ageing in more complex animals, like humans. Genes contain the instructions for building proteins – when a gene is expressed, the sequence of that gene is copied from DNA to an RNA template that will be used in a protein’s construction. All of the cells in your body have the same DNA, but most of their genes have been locked down so that only the genes relevant to the function of a cell are expressed. Stem cells are cells where gene expression is not locked down yet, such that they still have the ability to become multiple other cell types. Professor Bosch and his team set out to determine which gene (or genes) in Hydra conferred immortality. Hydra have three types of stem cells that are each able to continuously regenerate into different tissue types but otherwise, have unique roles and gene expression profiles. Since all three share immortal properties, Professor Bosch suspected that the gene of interest would be one that was expressed in all three lines. To test this, the team collected the RNA templates that were present in each of the stem cell types and sequenced them to determine which genes were being expressed. Once they ruled out genes that were not expressed in all the stem cell lines, a single candidate emerged: FoxO. To test the finding further, the team manipulated FoxO expression and confirmed that when its expression was high, stem cells proliferated and when its expression was low, cells lost the ability to regenerate. This was an exciting finding as FoxO variants in insects alter their lifespan and mutations in the human version of FoxO have been found in humans that live past 100. This manipulation also revealed another critical finding – the FoxO gene is tightly associated with the Hydra’s immune system and appeared to regulate how the Hydra interacts with its microbes. It has been shown that altering animals’ microbiomes can extend life and it may be that the Hydra’s microbiome also plays a role in its immortality. 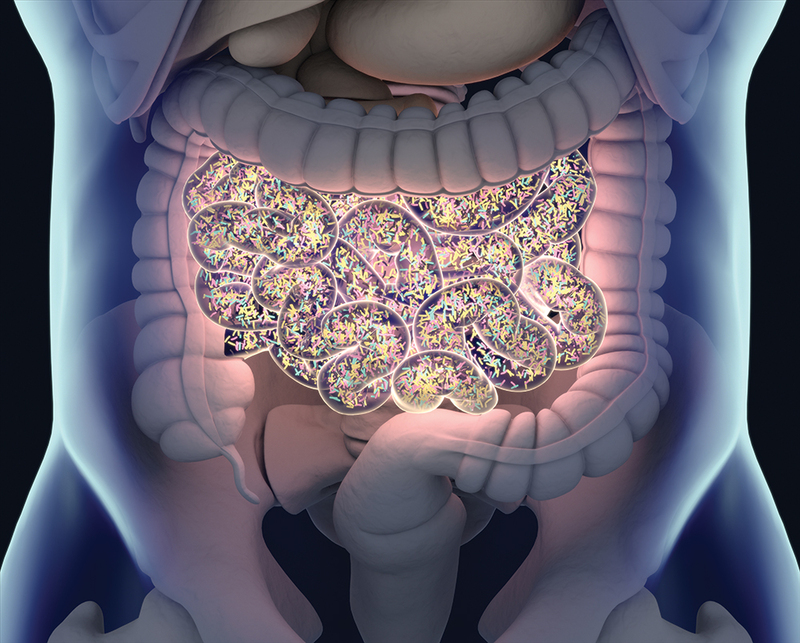 How the microbiome is regulated is a still largely a biological mystery. We know that organisms depend on their microbes to complete a large number of functions and that there must be constant communication between the host and its microbial communities to maintain this relationship. However, the mechanisms of this communication are not yet known. Professor Bosch became interested in understanding how Hydra manage their relationship with their microbes beyond FoxO. 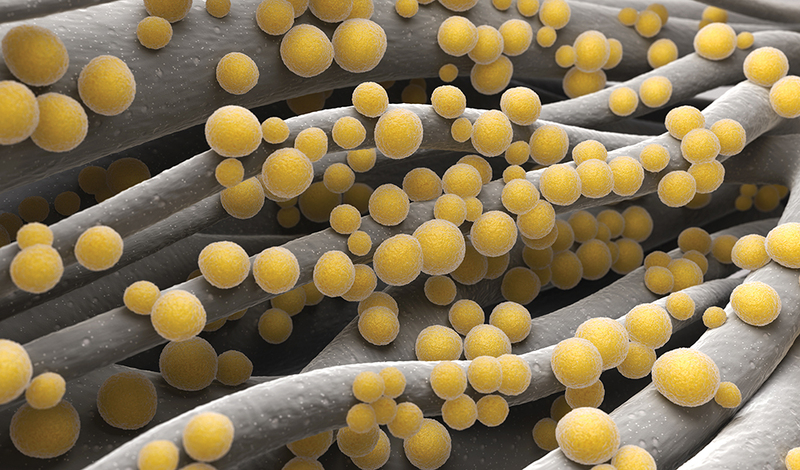 Organisms like animals and humans are constantly coming in contact with new microbes through both their skin and their gut, yet healthy organisms maintain a fairly consistent composition of microbial species on these surfaces. It is not known how this balance is maintained. Numerous studies have demonstrated that microbes interact with the nervous system through the exchange of neuropeptides, compounds that communicate with nerve cells or neurons. Professor Bosch observed that loss of neurons led to changes in bacterial composition and predicted that Hydra’s neuropeptides may play a role in shaping which microbes live on its skin and in its gut. They observed young Hydra as they grew and discovered that as the nervous system developed, the bacteria on the hatchling’s body changed. Further, some species of bacteria were relocated to specific parts of the young Hydra’s body. They found that the growing neurons were releasing neuropeptides with antimicrobial properties that were specific to certain species of bacteria. Different types of neurons released different neuropeptides, so that microbe species were relegated to different areas of the body. For example, a bacterium that was prevented from growing on the Hydra’s trunk was allowed to grow abundantly on its tentacles. 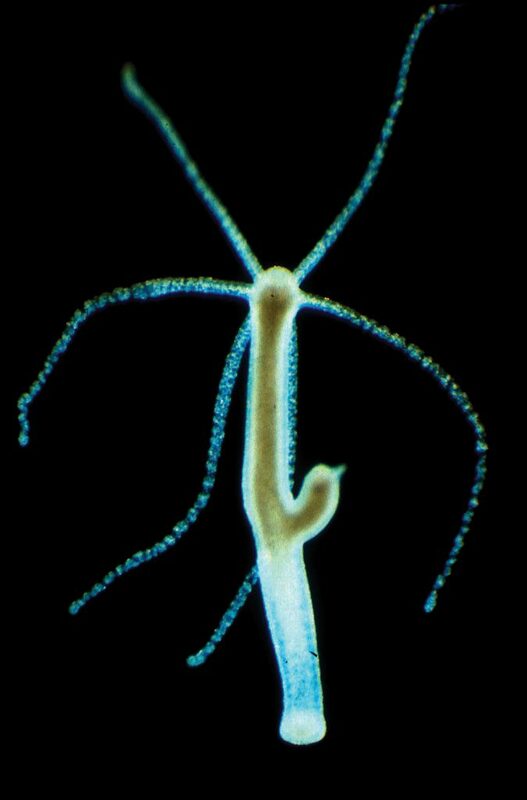 Amazingly, the Hydra’s nervous system communicates with its skin microbiome to determine how microbes are distributed. In the human body, many of our organs must contract regularly to maintain normal function. Though we have specialised pacemaker cells that keep things moving, it has been found that people with disorders that affect the contraction of their gut also frequently have abnormal gut microbiota. Though the Hydra’s gut is much less complex than a human gut, it does contract spontaneously at regular intervals. Professor Bosch and colleagues sought to understand how altering the Hydra’s gut microbiome might impact these contractions. To do this, they treated a group of Hydra with antibiotics that cleared the animal’s gut bacteria. The antibiotic-treated Hydra showed a striking reduction in gut contractions, despite no apparent changes in the ability of the gut cells to contract. When the same animals were re-exposed to their normal gut bacteria and their gut microbiome was re-established, normal contractions resumed. Interestingly, recolonising the Hydra with only one species of gut bacteria alone did not improve contractions and recolonising them with a mix of bacteria that was different from their original microbiome only partially restored gut movement. Hydra gut activity appears to depend on exactly the right mix of microbes for healthy function. Professor Bosch’s research in Hydra is illuminating the nuances of metaorganism biology. Even in a creature as simple as the Hydra, a complex interplay of genetics and physiology mediates and is mediated by, the microbiome. The relationships between a host and its microbial communities are deeply entrenched in the evolutionary history of both organisms, and the two are truly inseparable. 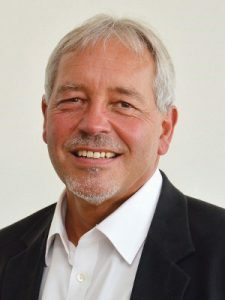 Professor Thomas Bosch completed his undergraduate and graduate studies in Biology at the University of Munich, earning his doctorate in 1986. He continued on to a postdoctoral position at the University of California, Irvine, USA and a professorship for Zoology at the Friedrich Schiller University of Jena, before joining Kiel University in 2000. Understanding the evolution and fundamental principles governing life processes in multicellular animals is a major goal of his research. He has published during his career over 150 research papers and articles and two books. From 2010 to 2013 he served as Vice-President of the university and now heads the Kiel Life Science (KLS) interdisciplinary research centre. He is the spokesperson for the DFG funded Collaborative Research Centre (CRC/SFB 1182) ‘Origin and Function of Metaorganisms’, which studies the role of multi-organismic interactions in health and disease. He is also the Editor-in-Chief of Zoology and former President of the German Society of Developmental Biology (GfE). His research work has been recognised by a number of awards including the Dr honoris causa degree from St Petersburg State University, Russia (2004). Professor Bosch is a Senior Fellow of the Canadian Institute of Advanced Research (CIFAR) and Fellow of the Wissenschaftskolleg (Institute of Advanced Studies) in Berlin. T Rees, T Bosch and AE Douglas, How the microbiome challenges our concept of self, PLoS Biology, 2018, 16, e2005358. R Augustin, K Schröder, APM Rincón, S Fraune, F Anton-Erxleben, E-M Herbst, J Wittlieb, M Schwentner, J Grötzinger, TM Wassenaar and TCG Bosch, A secreted antibacterial neuropeptide shapes the microbiome of Hydra, Nature Communications, 2017, 8, 698. AP Murillo-Rincon, A Klimovich, E Pemöller, J Taubenheim, B Mortzfeld, R Augustin and TCG Bosch, Spontaneous body contractions are modulated by the microbiome of Hydra, Scientific Reports, 2017, 7, Article number: 15937. A-M Boehm, K Khalturin, F Anton-Erxleben, G Hemmrich, UC Klostermeier, JA Lopez-Quintero, H-H Oberg, M Puchert, P Rosenstiel, J Wittlieb and TCG Bosch, FoxO is a critical regulator of stem cell maintenance in immortal Hydra, Proceedings of the National Academy of Sciences, USA, 2012, 109, 19697–19702.